When it comes to your oral health, missing teeth can make one of the most profoundly negative impacts on your mouth. When you go without teeth for any significant amount of time, a cascade of bad effects can take hold of your mouth. At Dailley Dental Care in Berkeley CA, we care about your health and want you to keep as many of your natural teeth as possible – for this reason; we offer dental bridges as well as some other tooth replacement options. Dental bridges allow us to replace teeth in both form and function, giving you the ability to eat and speak as you once did. The bridge is crafted to fit into your bite and (depending on the material used to craft it) looks just like your real teeth. Bridges are an extremely long lasting dental appliance and can last several decades if they are taken care of properly. A bridge needs a permanent anchor or abutment that we can attach it to in your mouth. We can use your natural, healthy teeth for this purpose or if you lack healthy teeth, we can place dental implants in your mouth that can act as an anchor for the bridge. If we decide to use your natural teeth as the abutments, we will shave off a portion of the enamel of the teeth that will be used as anchors so that the bridge will be able to fit over the tops of them. This is the same method that is used to prepare a tooth to receive a crown. 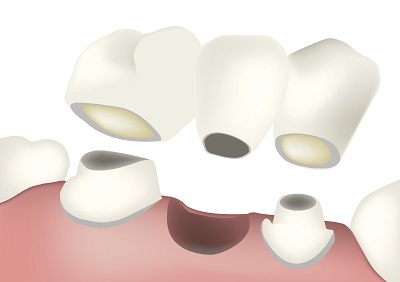 Using dental implants to anchor dental bridges is preferred because altering a natural tooth in this way leaves it in such a state that it will always require a bridge or a crown to be a viable tooth. When you decide that you want a bridge to replace your missing teeth, we will sit down with you for a consultation so that we can help you to decide what options work best for you. During this time, we will answer any questions you have regarding the appliance. We will decide which material works best and whether or not you want to use your natural teeth as the abutments or if you would like dental implants placed. We then take an impression of the area that we will send to our dental lab so that they can craft a custom-made bridge from the material of your choice. We will fit you with a temporary bridge so that you will be able to get used to the sensation while you wait for the several weeks that it will take to have the dental lab craft your permanent appliance. Once we have the permanent appliance in it will be time for your last appointment with us where we will remove the temporary bridge and affix the permanent one. Do you have questions about bridges? Are you ready to schedule your appointment at our Berkeley CA dental office? Give us a call at (510) 883-3454 today!